A first hand storm damage report came from Clifford Gray, who walked back through the Park late at night during Dec 23rd/24th. He dodged round one fallen tree on the cycle path from the zigzag railway bridge to the Auckland Road gates. 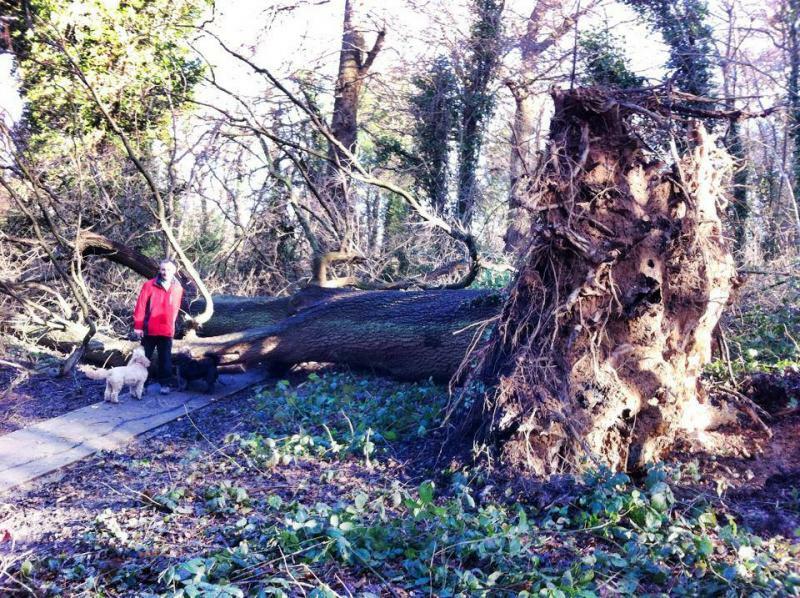 It was a calm, sunny afternoon on Christmas Day, so we walked around the Park, finding several trees in different places blocking the footpaths (later cleared by Kent High Weald Partnership). It was reassuring to see the 'ghost tree' (the dead tree in the wetland) and the three mighty oaks still in place though. Water levels were high, and we realised it was definitely the end of the repairs to the 'pallet' bridge over the chalybeate spring, near the electricity substation. Very high water here meant the bridge was almost submerged, so we walked through Connaught Park estate and back into the Park over the new bridge. Good news about the ‘pallet’ bridge: a temporary replacement will be built by KHWP volunteers on 26th February. After the 'What Next' meeting at The Allotment, Sarah Tree from KHWP got agreement from Peter Every of TWBC Parks Department for the work. A new, permanent bridge is part of the HLF work. Allotment holders also suffered damage to sheds and greenhouses as the strong winds passed through. More of the house Packs in the Woods is visible, as a large oak is down on the allotments, damaging sheds and flattening crops. A ornamental conifer fell in the bed next to the former park-keepers house. 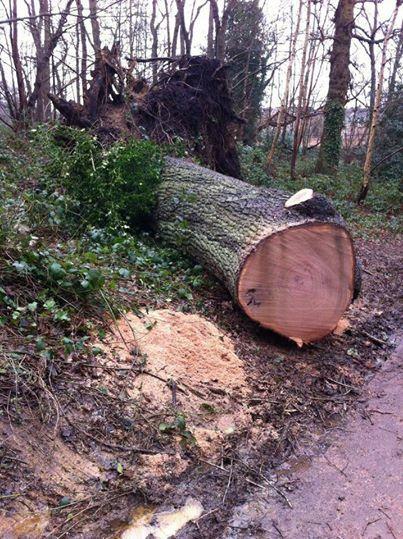 A shame to lose trees, but Mother Nature knows what she is up to! In early December, the first of two new transformers was delivered to the substation near the zigzag railway bridge. The transformers are ‘large pieces of equipment designed to step down the power which enters a substation. They are being fitted at the site as part of a £5.2 million investment project to meet growing demand’. The photograph to the right shows the substation from the railway bridge. The substation in Tunbridge Wells receives electricity at 132,000 volts and converts it to 33,000 and 11,000 volts for distribution across the area. Both deliveries are part of the ongoing refurbishment of the substation in Tunbridge Wells which serves a large area. The projects started in 2010 and will continue until 2016. Local residents may remember the controversy in 2006, when it was proposed that a permanent road should be built through the Park to deliver new transformers to the substation. Concerted pressure was put on the council and EDF to find an alternative. People power won the day!